A lot of people consider themselves dog lovers – and all for good reasons too. They are loyal, smart, and always there for you no matter what. Over 36% of the United States own at least one dog1, which is why dogs are proven to have many positive effects on people. Dogs may seem like the perfect pet, but we have to be aware of the necessary precautions that need to be taken if a dog bites you. When someone is bitten by a dog, they need to immediately act to avoid infections and further damage. There are different actions that need to be taken for the severity of the wound, but it is imperative to wash the wound right away. For minor wounds, be sure to apply antibiotic cream on the wound and cover it with a clean bandage. If the injury becomes red, painful, or swells, contact your healthcare provider. For deeper wounds, remember to apply pressure to the wound to stop the bleeding, but call 911 or see your healthcare provider immediately if you cannot stop the bleeding or feel weak after the bite. Always be sure to contact a healthcare provider if the bite has caused loss of function in the injury area, there is bone and/or muscle exposure, or extremely painful. It is also smart to seek help if you are not sure if the dog was vaccinated against rabies, or if it has been over five years since your last tetanus shot. In Rhode Island, there is a law called the “one bite” rule. 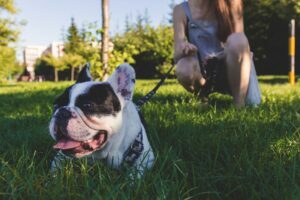 This rule requires an owner to show proof that they had knowledge of the dog’s vicious capabilities before the owner can be held liable for the victim’s injuries. If for some reason the injured party was bitten because they were instigating, teasing, or abusing the dog before the attack, Massachusetts has a specific exception for cases regarding such actions. Rhode Island, however, does not have these exceptions. It is always smart for someone who has been injured by a dog or animal bite to get in contact with a personal injury lawyer. These professionals will help you file a claim properly and get the compensation deserved. If you or a loved one suffered injuries due to a dog bite or dog attack, you deserve experienced help. The Rhode Island and Massachusetts dog bite attorneys at Bottaro Law have helped many clients settle dog bite claims, and we’re ready to help you too. Call us 24/7 at (401) 777-7777, or fill out a free consultation form today.